Comfort and style along with defined space, this three-seater sofa is a perfect furniture piece for any living room. Antique Design Wooden Sofa looks very graceful and is fully carved. 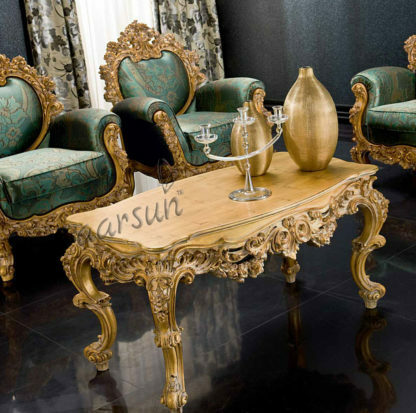 Aarsun Woods offers to you handcrafted wooden sofa made from premium quality Sagwan Wood by skilled craftsman from Saharanpur. The 3+1+1 seater Sofa with gold polish can transition any place into a beautiful classic set-ups. This sofa has a charming design. It also comes with very comfortable backrest. There is beautiful floral and petals designs across the frame with a beautiful upholstery.